Originally from Mexico, Manny Flores came to the United States in 1991, at the age of 13. He has been an employee with Plymouth Harbor for more than 12 years now. 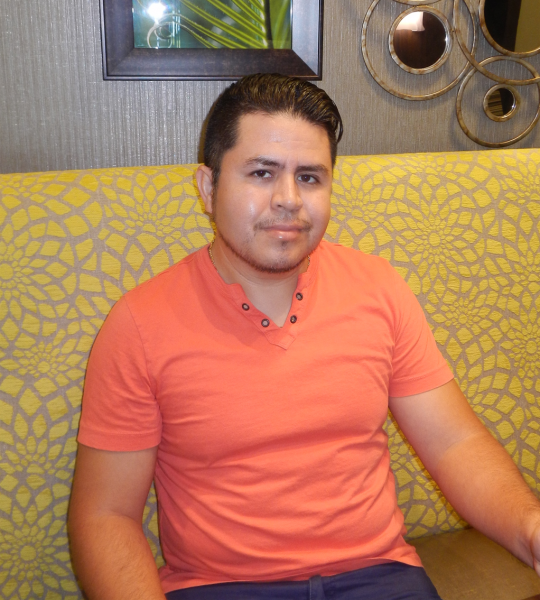 Initially starting as a Certified Nursing Assistant (CNA), Manny became a Licensed Practical Nurse (LPN) one month after joining the nursing team in the Smith Care Center (SCC). As a result, Manny began a one-year course at the Sarasota School of Massage Therapy, attending night classes while working full-time. He graduated in December 2015 and is now working as a licensed massage therapist, in addition to his full-time job as an LPN in SCC. Manny offers complimentary chair massages in the Wellness Center each week, on alternating Tuesdays and Wednesdays, from 9:30-11:30 a.m.
One of massage therapy’s obvious benefits is relaxation, but it offers so much more than that. Not only can it help by relaxing muscle aches and pains, but it can improve range of motion, flexibility, and circulation, and decrease stress and anxiety. In addition to his work at Plymouth Harbor, Manny operates his own massage therapy business, Healing Touch, offering in-home massage services. Outside of work, Manny enjoys soccer and working out. To learn more, stop by the Wellness Center on Tuesday mornings, or find Manny’s information in the Wellness Center’s Preferred Professionals Brochure.